Import hashes from binary files. Windows Password Recovery can extract password hashes directly from binary files. Even those of them that are currently used by the system (i.e. locked). 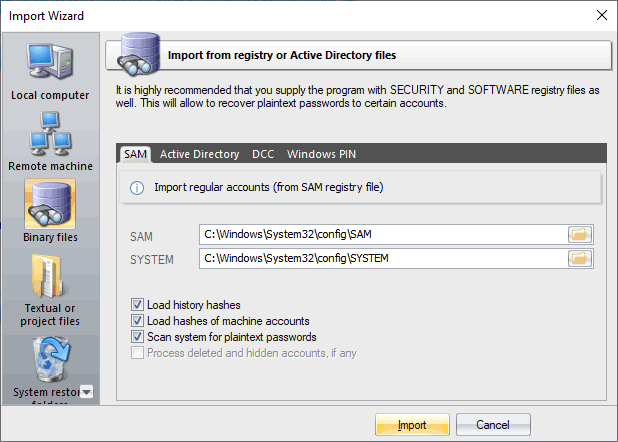 Normally, password hashes are stored in the registry file SAM, which resides in the '%WINDOWS%\System32\Config' folder. The same folder contains the SYSTEM registry, which is necessary for the recovery. If you have specified path to the registry in the current system, parsing it will take a bit longer (normally by a few seconds). Password hashes for domain accounts are stored in the Active Directory database; or, to be more specific, in the very heart of it, in the ntds.dit file, which resides in the folder: '%Windows%\ntds'. The recovery of domain accounts also requires the SYSTEM registry file. Be careful! Dumping from the current system's Active Directory database may take some time, especially when ntds.dit is of a considerable size. The program works properly and supports all the SYSKEY encryption options: Registry SYSKEY, SYSKEY startup diskette, SYSKEY startup password. If you are copying the files from another system, besides the SAM (ntds.dit) and SYSTEM files, it is also highly recommended to copy the SECURITY and SOFTWARE registries (they should be located in the same folder with the SYSTEM file); that would allow you to recover the passwords to some user accounts quicker. Turn on/off password history parsing. Turning off history load will increase database processing. From the other hand, when attacking hashes, guessing history passwords may give a clue to figure out the password for the primary account the hashes belong to. Discard loading machine accounts (ones end up with $ character). All trademarks, logos, product names, pictures, videos, sound or any other information related to the Web site or displayed herein are the property of their respective holders. Passcape is a trademark of Passcape Software.